Enables the clutch and brake or front and rear brake to be operated with only one hand. Trike & motorcycle Dual-lever / k-lever twin clutch & brake levers operate clutch & brake or front and rear brakes with one hand !! This unique Dual-lever system Can be fitted to either side of the handlebars to operate both the clutch and brake or the front and rear brake. Manufactured to the very highest standards and using the latest engineering techniques this new system sets a new benchmark in the world of the disabled rider, allied to the Flatshifter Expert System (clutchless up & down gearshift systems ( Expert system) and button operated gear selector kits) ( Max system) riders with paraplegia, disabled motorcycle riders, amputees etc can now ride a bike, trike or an outfit with complete confidence, enables motorcycle & trike riders who only have the use of only one arm to control two levers in one neat lightweight fully adjustable assembly. Can be easily reconfigured to suit your new motorcycle or trike if or when you update it. Cable operated clutch with hydraulic brake no problem. Hydraulic clutch with hydraulic brake operation no problem. 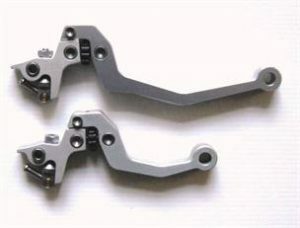 Matching clutch lever also available, if you’re using your dual lever for front & rear brake operation. Hydraulic modules are available in either 14.0mm or 17.5mm bore sizes so that the front and rear master cylinders can be matched to the calliper sizes for the optimum braking performance. unlike any similar systems. This symmetrical design enables left or right-hand mounting. One assembly with hydraulic & cable operation. Can be set up for clutch and brake operation or front brake & rear brake operation. Built-in rearview mirror mounting boss. Clutch and brake Lever offsets are fully adjustable. Lever ratio is also fully adjustable on hydraulic assemblies. Fits handlebars that are 7/8” or 1”diameter. U.S. Patent applied for # 61078875. Twin cable, twin hydraulic or single cable and single hydraulic. 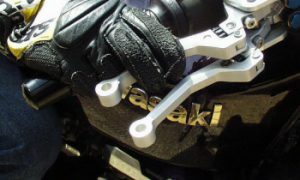 Variable length/angle clutch/brake levers for the most comfortable set up. This Dualever kit can be easily reconfigured to suit your new motorcycle or trike, so no need to purchase a new Dualever if or when you update your machine, ie you will get the very most from your investment. 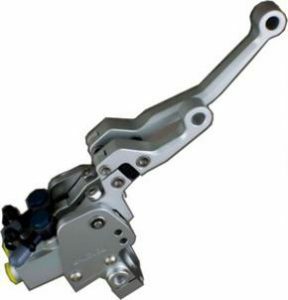 Each lever has a large adjustment range which results in a total possible offset of more than 60mm (2- 1/4”) hydraulic modules are available in bore sizes of either 17.5mm or 14.0mm so both front and rear brake or clutch master cylinders can be matched to the caliper sizes for the optimum braking performance, or alternatively use one lever to operate the clutch the other lever the brake. Matching clutch lever is also available if required. Flatshifter Dualever, only £999.00 GBP + vat (vat EU countries only) one price only, includes whatever offset levers or master cylinder sizes you require. Do you ship to ??? yes, we ship worldwide, no problem. Does the cost price of the Dualever include whatever set up i require i.e. if twin hydraulic, or cable & hydraulic, and the different length & angle clutch & brake levers etc.. Yes, the Dualever will come set up to your needs. no extra cost. I have a cable clutch and want to transfer it to the right-hand side along with the front brake – will the Dualever allow this? Yes, the Dualever is able to offer both cable and Hydraulic operation on either the left or right h/side of the handlebars, whatever your setup requirement it is all included in the price. How do I operate the levers independently? The levers have a wide range of adjustment and can be offset from each other. Also, a longer lever (+30 mm) can be fitted to one module thus enabling two or three fingers to grab one lever and the other fingers can easily reach up for the shorter lever. I have car callipers on the rear of my trike and a standard bike rear master cylinder does not have enough fluid displacement to work them – will the Dualever operate them? The Dualever has a choice of bore sizes – either 14.0 mm or 17.5 mm we would recommend the 17.5 mm bore for your rear brake operation. I have 1″ bars on my machine will the Dualever fit these? Yes, the Dualever is supplied with an adapter that enables it to be installed on 1″ or 7/8″ bars. If I buy a Dualever and subsequently sell the machine can I transfer it to a different machine? Can I purchase a matching clutch lever to operate a cable or hydraulic clutch? Yes, a matching hydraulic or cable clutch lever that matches the Dualever system is available please inquire. Do you have any other unique new products being developed for disabled riders? Yes, we are also developing a throttle for left-hand use, and an automatic clutch system with no rider input required at all even when selecting 1st gear and pulling away. No, but all systems are designed for D.I.Y fitment or can be fitted by any competent mechanic or your local bike shop. We also have various centres who can fit them for you if required, a complete installation manual is included. Can I become a distributor for all or just some of your Flatshifter Systems? Yes. we are always happy to discuss possible distributorship agreements with other businesses in countries worldwide. Please contact us for further details on +44(0)1206 322557 or Email: mail@flatshifter.com. Do Flatshifter offer technical support over the phone and via email? Yes. Flatshifter technicians are available to help you on the telephone at +44(0)1206 322557) and via Email – mail@flatshifter.com. THE FLATSHIFTER DUALEVER IS SUPPLIED WITH A COMPREHENSIVE INSTALLATION MANUAL, FITTING KIT AND A 12 MONTHS BACK TO BASE WARRANTY. It’s unwise to pay too much, but it’s unwise to pay too little. When you pay too much you lose a little, that is all. When you pay too little, you lose everything, because the thing you bought was incapable of doing the thing you bought it to do. The common law of business balance prohibits paying a little and getting a lot, it can’t be done. If you deal with the lowest bidder, it’s well to add something for the risk you run.